Package your pasta salad, soup, or stew with this ChoiceHD 32 oz. round deli container and lid combo pack! This combo pack comes complete with an equal number of containers and tight-fitting lids. Use it to package and store food with ease, and it also provides guests with an easy way to take home your signature dishes. 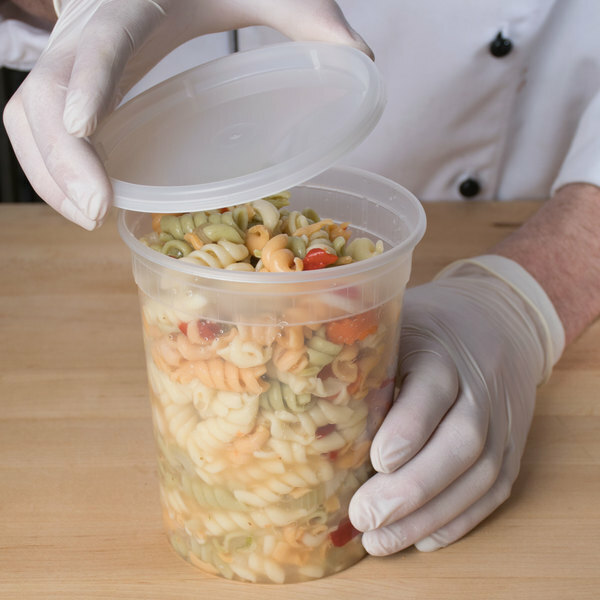 Both convenient and versatile, this container and lid combo pack is ideal for any deli, grocery store, or restaurant take-out application. 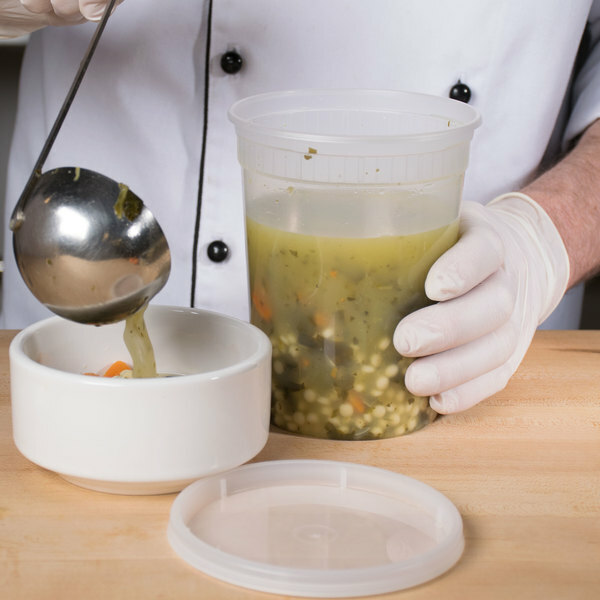 "Perfect for storing soups and salads. BPA free so hot liquids are not a problem, being reusable is a such a great plus, absolutely will be repurchasing!" Each container is made of heavy weight polypropylene plastic to secure your premium hot or cold products while on display or in transport. 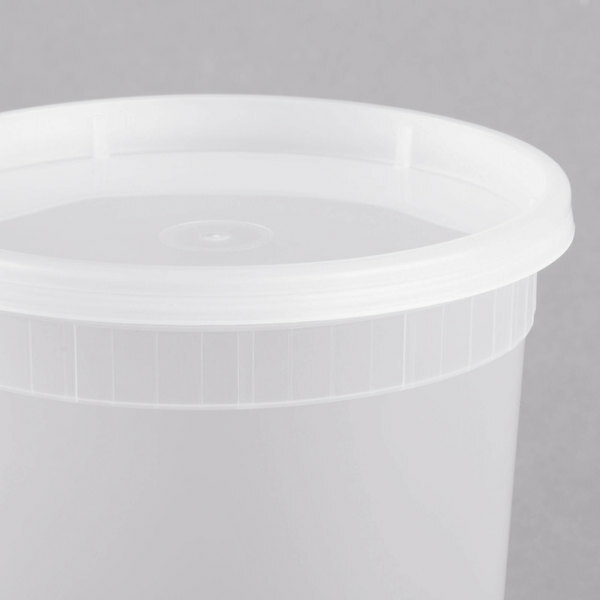 The dependable design withstands repeated use, making these containers and lids a reusable option in commercial settings. Plus, it's even safe for use in low temperature dishwashers for your convenience. This product promotes fast product identification, whether on display in a deli case or stored in a refrigerator. 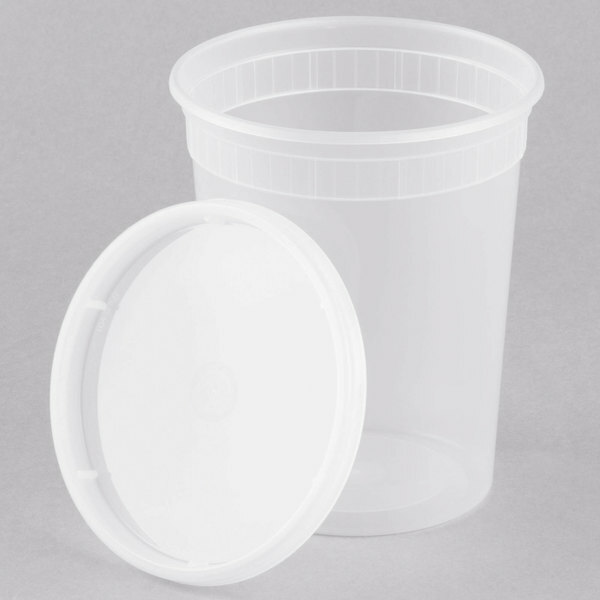 The container's durable, curled rim creates a tight seal when used with the polyethylene lid to reduce spills and messes. Designing and creating products with the cost-efficient consumer in mind, ChoiceHD provides high-quality items for a low, economical price, and this deli container and lid combo pack is no exception. This "house" brand is far inferior to the Pactiv Newspring Delitainer containers. We have had customers complain of broken containers ever since we were sent this house brand instead of Pactiv Newspring. We could tell instantly the difference in thickness and sturdiness when the box arrived, but the company told us it's "as good or the same as" Pactiv. Not so! We appreciate your review, Divya! If you are looking for more information on the product that you are purchasing, please contact our Customer Solutions team. 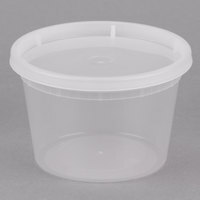 I use quart containers the most, and you can never have enough lids. For the price this is a big cost saver. 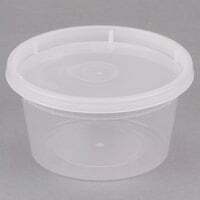 The containers are good plastic too; not too thin. You can put hot liquids in them no problem. Great product. Very heavy duty. Lids fit securely with no leakage. Useful for freezing soups and sauces. Love being able to go from freezer to microwave. 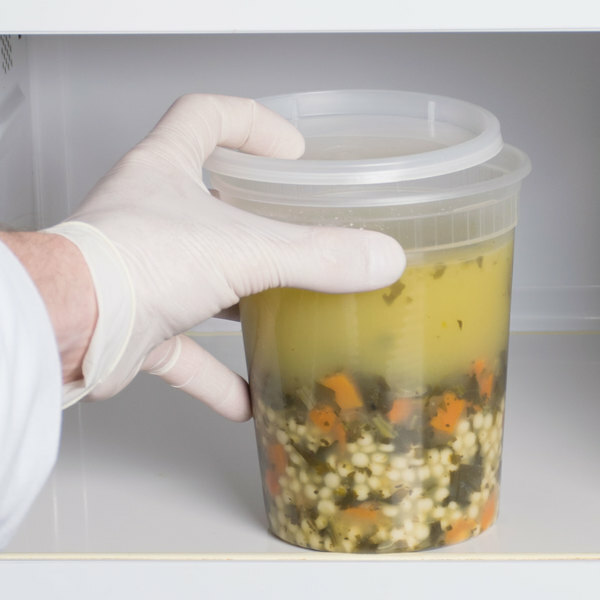 These containers are a great solution for storing leftovers. We keep a case in our kitchen and works perfectly for clean up and dispersing food after events. Also, I love that they are clear and you can see what is inside. They are sturdy enough to stack well in fridge or freezer. We started using these cups and sales have increased. It’s great because customers can see the product and it makes it much more enticing!!! It has also saved in production time since the lemonade is made directly in this cup! Extremely handy to have these around the kitchen. Obviously they're great for storing food in the fridge and pantry, but my favorite thing about these is that they work really well as a cup for an immersion blender. Perfect for storing soups and salads. BPA free so hot liquids are not a problem, being reusable is a such a great plus, absolutely will be repurchasing! 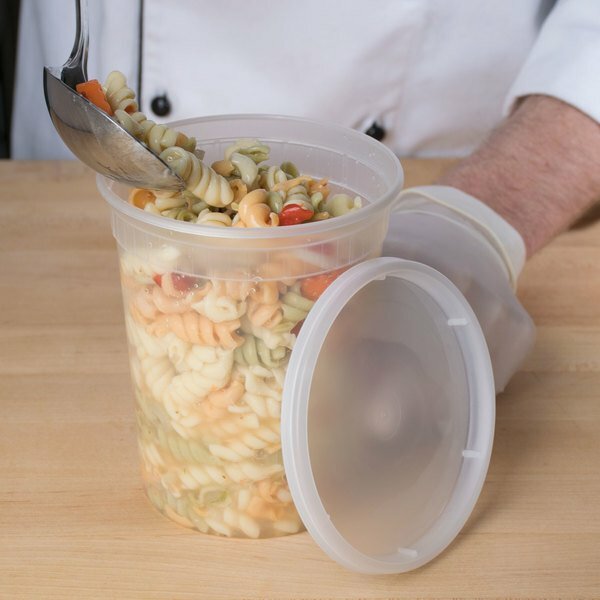 This is an amazing Container with a lid and microwavable! You can put liquid and solid items and food in it! Very durable and Money-saving! 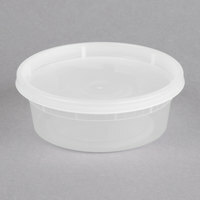 These are perfect to go containers for soups, we have soups our customers order and they work great!!. The lids stay on tightly, no leaks or spills!! These are great for displaying and storing our homemade chicken salads. 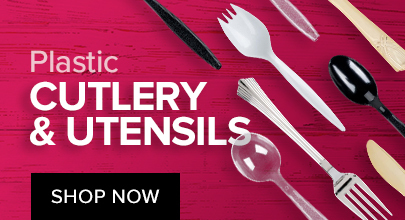 They are also perfect for storage of dry ingredients and work well for our frozen soups! This is a great price for great quality containers. I use these in both the refrigerator and freezer. I find they stand up to heat surprisingly well. I sometimes toss into the dishwasher, but usually I recycle these when I am finished with them. Very convenient. 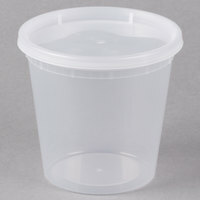 These are great containers for storing and packaging food items for sale. They are microwave and dishwasher safe. The tops provide a great seal and our customers love the fact that they can use them over and over again. The only issue we've had is that a very few of the containers have arrived with cracks in the top rim. Second time ordering these. The product is as advertised and sturdy. Stands well with microwave and dishwasher use. Several containers were damaged probably because of shipping. Some padding for the containers may help avoid. Contacted customer service and they promptly addressed the issue and handled it very professionally. Would buy again. I am surprised and excited that we are saving so much money with this product. Same quality we have been getting from our regular supplier for a fraction of the price. Can't beat that ! Great containers! Lids fit securely and holds a lot of food. We also use them for small toy parts. Really good strong quality. Highly recommend! 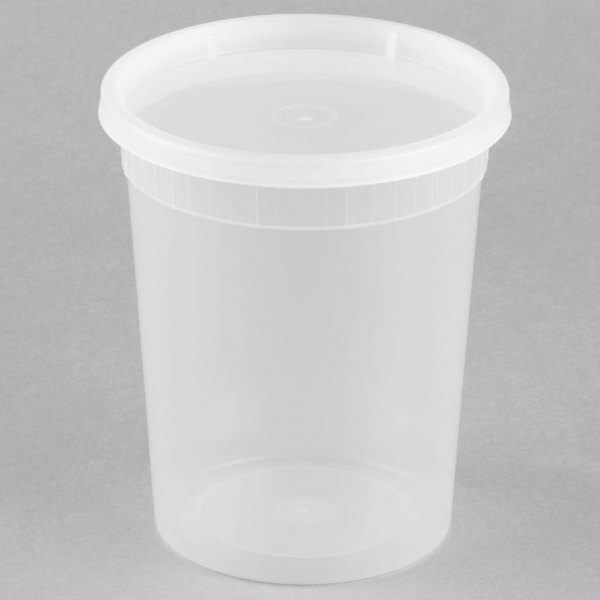 Quart containers. I have had no issues with containers sticking like I have had in the past. These containers are a must have for the restaurant.